This Memorial Day weekend was splendid here in Portland. The weather forecast called for rain but the rain managed to hold off both Saturday and Sunday. My mission this weekend was to find some dressers as I have been sold out of them for quite a while now. My efforts were rewarded as I found 3 dressers. I even found a cute little Swedish viking to add to my viking collection. The brand on the shield reads "Gislaved". This is the name of a town in Sweden. He looks right at home with all of my other Danish vikings. The big score of the weekend was this Danish secretary desk and lowboy dresser. Bornholm Mobler secretary desk. SOLD at Hawthorne Vintage. Lane lowboy dresser. SOLD at Hawthorne Vintage. 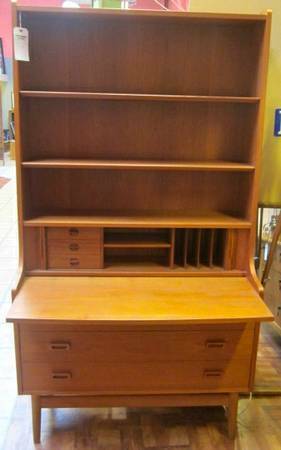 Vintage American desk and pair of dressers. Each piece is available at VDC and priced at just $125 each. I LOVE that secretary desk!! So very beautiful. You find the very best! Thanks for hosting. Great finds this week. Thanks for hosting. Everything is, as usual, awesome. I'm really wishing I was closer because I don't know if I would be able to pass up that American desk and dressers. I have the perfect spot for them. I have estate items that I must get rid of. None of it is junky. I have rattan and upholstered sofa and love seat, lamps, rugs, china, crystal, silver, original paintings, etc. Are you interested?